A member of the farm team stands with a sedated and blindfolded white rhino before its horn is trimmed at a ranch in South Africa. In a bid to prevent poaching, the horns of the animals are regularly trimmed and the ranch is under armed guard. That’s how many genetic samples from crime scenes have been submitted to a DNA database of African rhinoceroses, which has resulted in more than 120 poaching convictions over the past eight years. A paper published this month in Current Biology declares the database project a success, even though only 2 percent of the queries have resulted in criminal cases. Researchers found that targeted use of the database was useful in cracking the transnational syndicates that run the illegal trade. 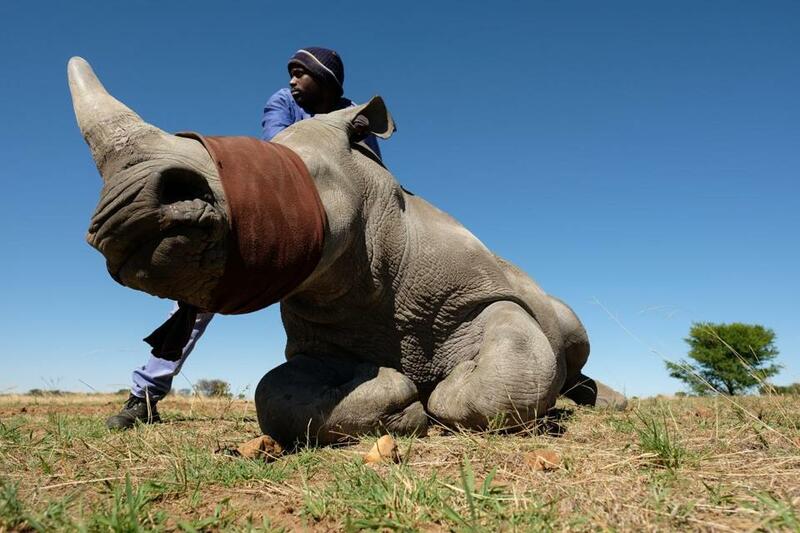 Rhino horns are particularly prized in Asia, where a kilogram of horn can sell for $60,000.